Happy Memorial Day! Here's your Saturday Night Special. We have been roaming The Social Media Darlings of Facebook & Twitter because of our newly-launched Salmon River gig. 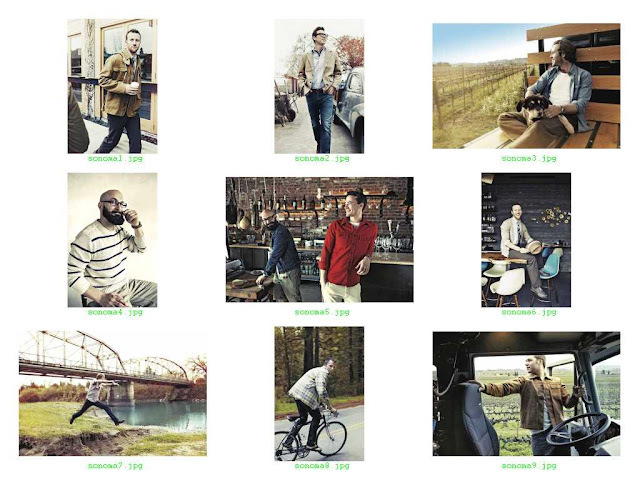 Outside Magazine put out an article today on the hot new men's style of Sonoma Wine Country. In honor of our own Happy Hour Whine Time tonight we messed around with the photos of these nine dudes and made a contact sheet JPG out of them. Naturally, as you would expect, they are all young, up and coming professionals making a name for themselves in a very high rent California area known simply as "Sonoma." Well, the reason we are putting up this blog post about these expensive clothes is that we could buy almost any outfit you see here at the t-stores we love for next to nothing. These dudes have spent hundreds of dollars on their duds. We could find practically the same thing that any of them are wearing at Deseret Industries, The Challis HUB or Salmon's Rags N Wags. Prices would vary, of course. DI would charge the most and we'd probably have to pay about $15-$20 for a similar outfit. At the HUB everything is 50 cents so we could get a similar outfit there for a couple of bucks. Salmon's Rags N Wags is pricier than Challis so I'd reckon we'd have to pay as much as $5-$10 for a good looking outfit like these dudes are wearing. It never ceases to amaze me what people pay for new, off-the-shelf clothing in this day and age. Anyway, if you have nothing better tonight to do, you can click here to see Outside Magazine's celebration of excessive clothing consumption b y young men with too much money and too little common sense. PS--I really DID need to refresh my memory on how to make a contact sheet of a lot of images. This was the perfect exercise.